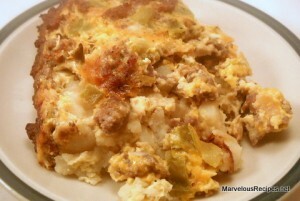 A delicious breakfast or brunch casserole that’s so easy to put together! Refrigerate to blend the flavors then pop it in the oven for a tasty and satisfying meal! 1. In a large skillet, cook the sausage and onion until the meat is no longer pink and onions are tender; drain. 2. Coat an 11×7-inch casserole with cooking spray. Layer the potatoes, meat mixture and cheese in prepared casserole. 3. In a medium bowl, whisk together the milk, flour, eggs, salt, pepper and Chile peppers; pour over potato mixture. 4. Cover and refrigerate for 4 to 24 hours. Remove from the refrigerator about 30 minutes before baking. Bake at 350 degrees F for 1 hour or until a knife inserted near the center comes out clean. Let stand 10 minutes before serving. Makes 6 to 8 servings. this sounds delish…gonna have to try this one!! 🙂 thnx! I am going to make this for Sunday school next Sunday! I know my friends will love it!! Ooh, I’m always looking for someting like this for Christmas time. I made this for my family’s Christmas breakfast and it turned out great. I put it together last night using Jimmy Dean “maple” sausage. I checked it to make sure a knife would come out clean at around 50 minutes and it was ready to come out of the oven then so don’t wait until 1 hour to check it. I will definitely make this again.